Corsair has debuted what it describes as the company's most efficient and feature-rich power supply ever. That PSU is the AX1600i, available for $499 (£409). Such an outlay is considerable, of course, but so is the technology, according to Corsair, so let's take a look. 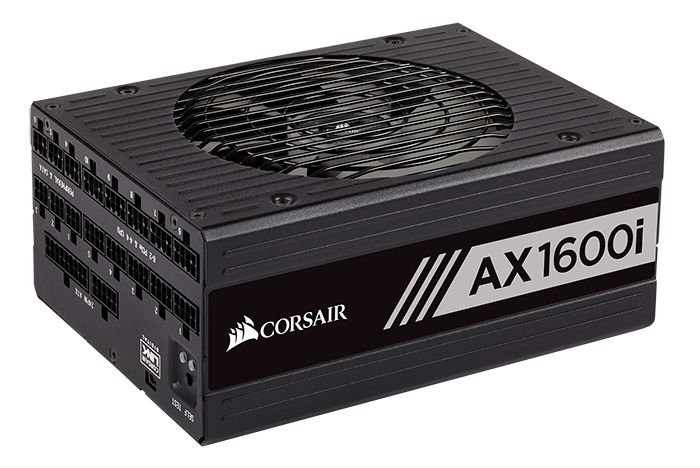 Outwardly, the AX1600i, which replaces the $450 AX1500i as head honcho, is typical Corsair in appearance. Construction is solid and the supply offers interchangeable magnetic labels - blue and red - for better colour coordination in your build. At 200mm deep, it will fit into practically all mid-tower chassis, but given its capacity and intended market, we expect it to find a home in a full-tower box. Actually, it is 20mm shorter than the AX1500i, and a 140mm fluid dynamic fan is carried over from that model. Basic specifications are clearly premium. The supply is certified with 80 PLUS Titanium, meaning it has to be 96 per cent efficient at a 50 per cent load when connected to a 230V source. It's fully modular, too, and has a hybrid-fan mode that doesn't activate until load reaches 40 per cent (640W). The fully-modular section means that one can attach a heck of a lot in one fell swoop, though there's not a whole heap of space between the PCIe and CPU ports. The self-test is handy from a diagnostic point of view, working by running a simple check. Should everything be okay, the green LED lights up, though do be aware that you need to have the main ATX power cable disconnected. The cables are voluminous. In sum, there are 20 of 'em, all of decent lengths. The eight - five SATA and three Molex - covering peripherals are standard and are the same as on previous generations. In sum, there are 16 SATA and nine Molex. 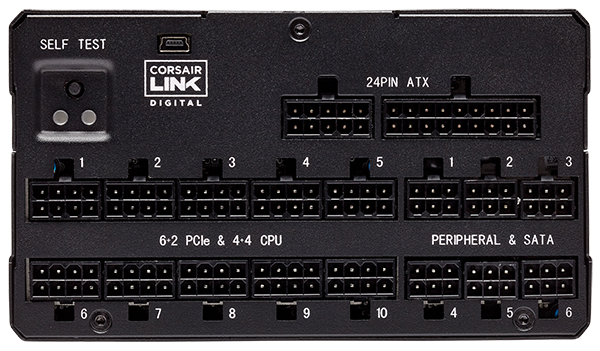 However, given that Corsair wants to have class-leading ripple suppression, the decision has been made to add capacitors to the two 8-pin CPU, eight 8-pin PCIe, and main ATX. You may hear of these being referred to as Type-4 cables and were first seen on the RM series that excelled in ripple suppression. The 24-pin cable, meanwhile, has extra pins for sensing voltage; the resultant readings are then fed into the Corsair Link utility - note the micro-USB connector just above the Link logo - for real-time feedback. Fan speed and temperature are also logged by Link, as well. Inside, it's Flextronics who provides the engineering excellence that Corsair is after with this top-tier supply. And the biggest departure compared to traditional supplies is the move away from silicon to gallium nitride (GaN) field-effect transistors (FETs). What's in a name, you may ask, but this technology enables Corsair to hit ever-higher efficiencies. In a nutshell, gallium nitride's electrical properties mean that it can handle more power than silicon, so FETs using the technology can switch more quickly and with less energy. Though using GaN instead of silicon is the headline-grabbing feature, Corsair looks at efficiency throughout a PSU's flow. Combining it with totem-pole PFC at the front-end reduces power-loss (thus increasing efficiency) by a quantifiable degree over the best on the market, and it is reasonable to think that powering premium supplies of 2020 and beyond; ones hitting 95 per cent efficiency over a wide load, will need to use this combination of GAN + totem-pole. Silicon and dual-boost PFC isn't going to cut it, and Corsair says that while the previous champ, AX1500i, has a PFC that is about 93 per cent efficient, the Transphorm hardware used here ups that to 99 per cent. Corsair, in concert with Flextronics, is using the AX1600i to usher in a new era of super-efficient, tight-regulation PSUs. This PSU isn't for everybody, because the price tag takes care of that, and we feel it's more of a showcase of where the industry is headed in the quest for genuine improvements to efficiency, regulation and ripple suppression. On a more practical note, soldering is first class, and thanks to the smaller, denser FETs, the size isn't silly. As one would expect, the supply is littered with all-Japanese capacitors rated to 105°C... but we imagine there is no need for such high certification as it shouldn't ever get too warm. We've shown the AX1600i using a single rail that can deliver the entire 1,600W down the chute, but the supply can also be configured, via Link, to run with up to 12 (yes, 12) individual 12V rails capped with over-current protection of your choice. The same Link can also be used to set a custom fan curve, though out of the box the noise profile from the 140mm spinner is reckoned to be comfortably under 15dBA at 1,000W. 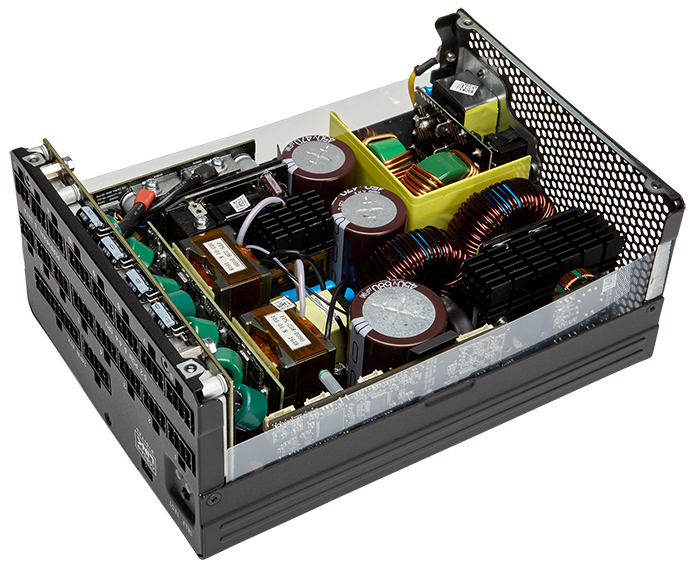 Backed by the usual 10-year warranty, the AX1600i is a showcase of what an ultra-high-end PSU ought to look like in 2018.